New Orleans is the home of jazz music; Detroit the home of Motown. Memphis gave us Elvis, Seattle gave us grunge, and the Bronx gave the world the hip-hop sound. And when it comes to country music, one US city eclipses all the rest: Nashville, Tennessee. Today, Nashville is the epicenter of country music. 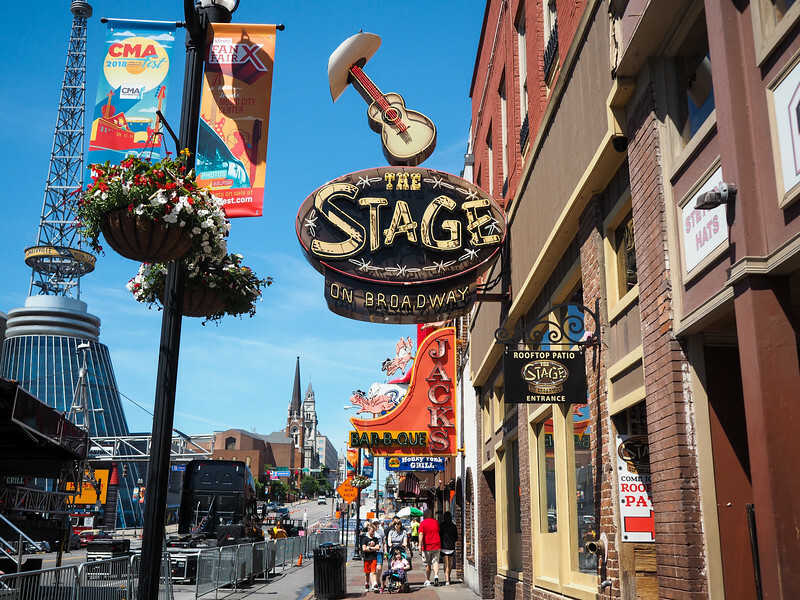 Just like actors flock to Los Angeles and Broadway hopefuls make a beeline for New York, anyone hoping to make it big in the world of country music will eventually find themselves in Nashville. 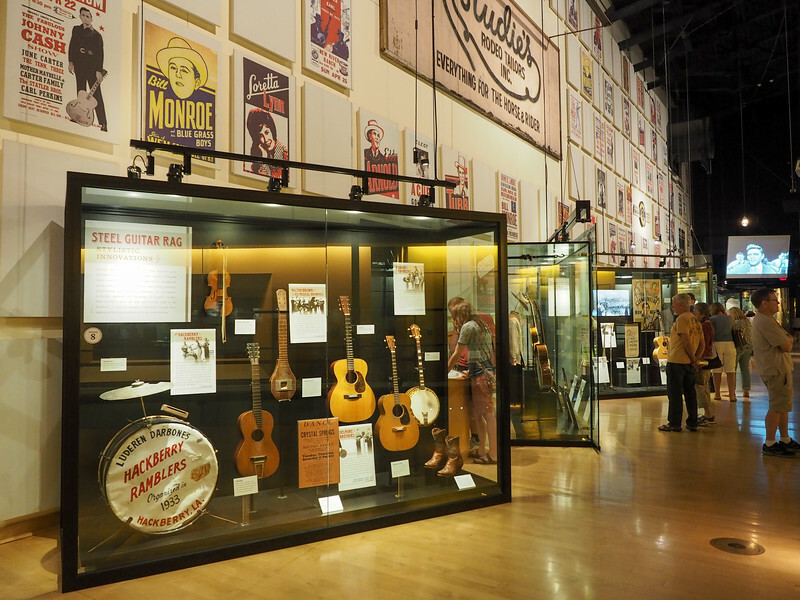 With its never-ending string of honky tonks, the Country Music Hall of Fame, and iconic performance venues like the Ryman Auditorium, country music is ingrained into the very fiber of present-day Nashville – but it wasn't always this way. Like many forms of popular music, country music went through an evolution. It began developing in the 1920s as a mix of the “hillbilly” sounds of Appalachian folk music, western swing, and even the blues. It developed into bluegrass and honky-tonk music in the 1940s, and then along came the more-polished “Nashville sound” in the '50s and '60s. Country music has always been rooted in Tennessee (it's said that the genre was “invented” in Bristol, Tenn., in the 1920s), and today it's definitely that “Nashville sound” that still largely prevails on the radio and the Billboard charts. Which is probably why Nashville is now regarded as the “home” of country music. I'll be honest with you: I was not brought up listening to country music. My mom is a huge Beatles fan, and my dad… well, my dad will still tell you that one-hit-wonder Vanilla Fudge is one of the greatest bands ever. So while I can rattle off some of the big names in country music and sing along to a few famous hits, it's not a musical genre I can say I'm super familiar with. So on my first visit to Nashville, I decided I wanted to soak up as much of the city's musical history as I possibly could. 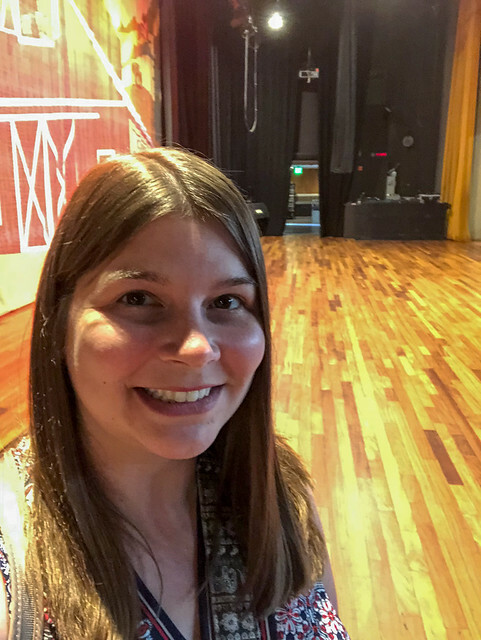 I'm a self-proclaimed history nerd, after all, and what better place to learn about country's history than the heart of the country music industry? Start at the Ryman Auditorium, which is often referred to as the “Mother Church of Country Music.” The Ryman was founded 1892 – but it wasn't originally a music venue, and it wasn't originally called the Ryman. 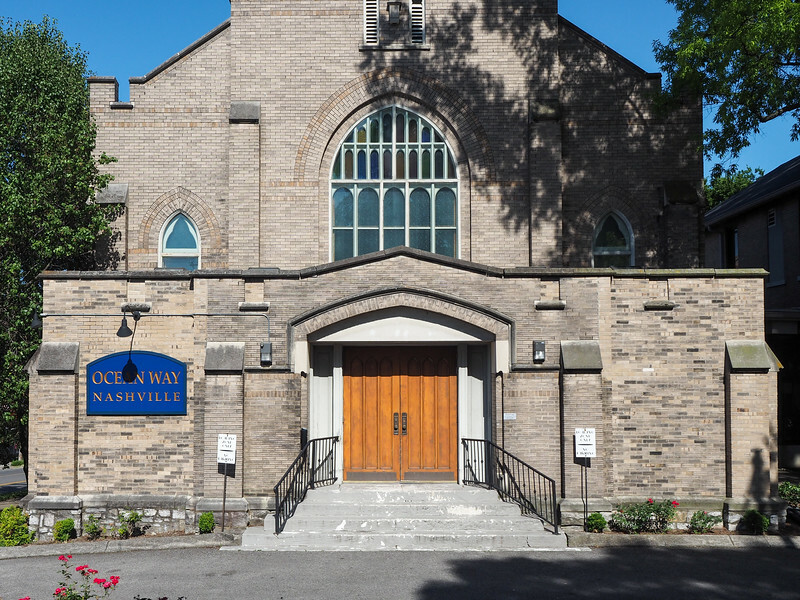 It originally opened as the Union Gospel Tabernacle, built by Nashville riverboat captain and saloon owner Thomas Ryman. In 1885, Ryman attended a religious gathering led by revivalist Samuel Porter Jones, intending to heckle the man who was trying to save the souls of Nashville by speaking out against the very businesses Ryman was running. But Ryman instead was converted, and was inspired to build the tabernacle. When Ryman died in 1904, the building was re-named in his honor. Even though the tabernacle was built with religious gatherings in mind, it was also often leased out for non-religious events in an effort to pay off its debts. A woman by the name of Lula C. Naff began working part-time to book and promote everything from concerts to boxing matches at the Ryman, and eventually became the Ryman's manager. She kept the venue afloat through the Great Depression and beyond, and is credited with much of the Ryman's enduring success. You can tell that this used to be a church! Everyone from actors to US Presidents to ballerinas have graced the stage of the Ryman over the years, but its legacy mostly centers around it being the “Mother Church of Country Music.” The Grand Ole Opry moved in to the Ryman in 1943 after outgrowing four other venues (really, the audience was too rowdy for all its previous venues), and stayed until 1974. Bluegrass music was “invented” on the Ryman stage in 1945 when Earl Scruggs made his debut with Bill Monroe’s Blue Grass Boys. And, perhaps most notably, the recording of “At the Ryman” by Emmylou Harris in 1991 saved the building from being demolished. 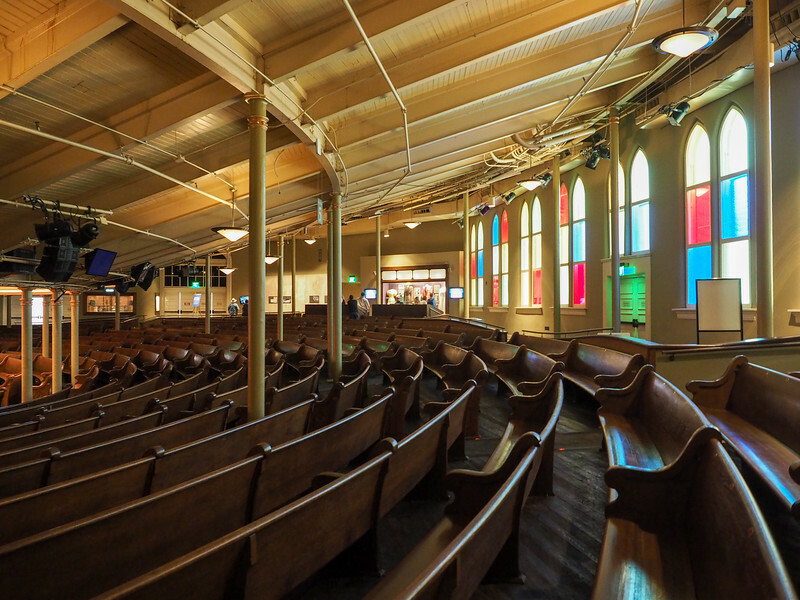 Taking a tour of the Ryman Auditorium is a must-do in Nashville. There's so much history in the building, from the original pew-style benches to the wooden floors and ceilings that add to the venue's excellent acoustics. 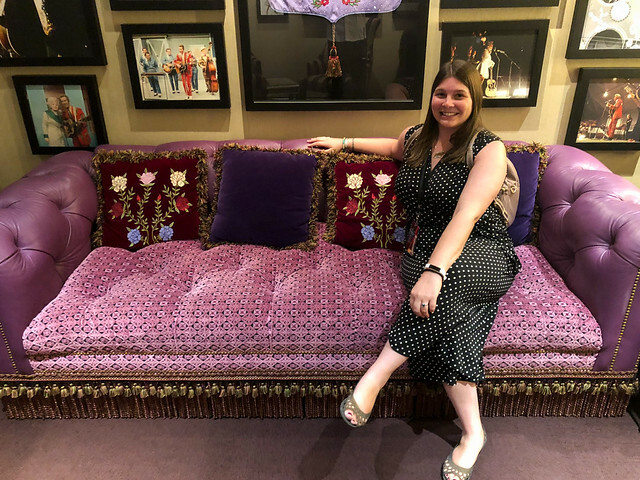 I took the guided backstage tour of the Ryman, which takes you into the dressing rooms that were added in the '90s once the Ryman was finally renovated (for its first 100 years, it had neither dressing rooms or air conditioning), and also onto the Ryman stage. Me on the Ryman stage! You'll hear lots of fun tidbits about the Ryman and the people who have performed there (for example, did you know that Helen Keller was the first one to sell out a show, or that Elvis performed only once at the Grand Ole Opry because the audience didn't like his gyrating hips? ), and you can appreciate it even if you're not a huge country music fan. 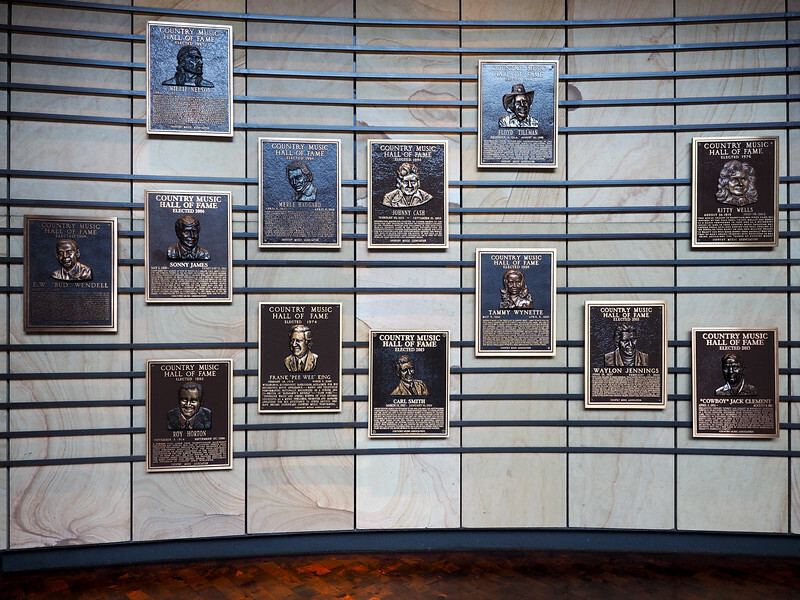 After touring the Ryman, head down the street a couple of blocks to the Country Music Hall of Fame and Museum. 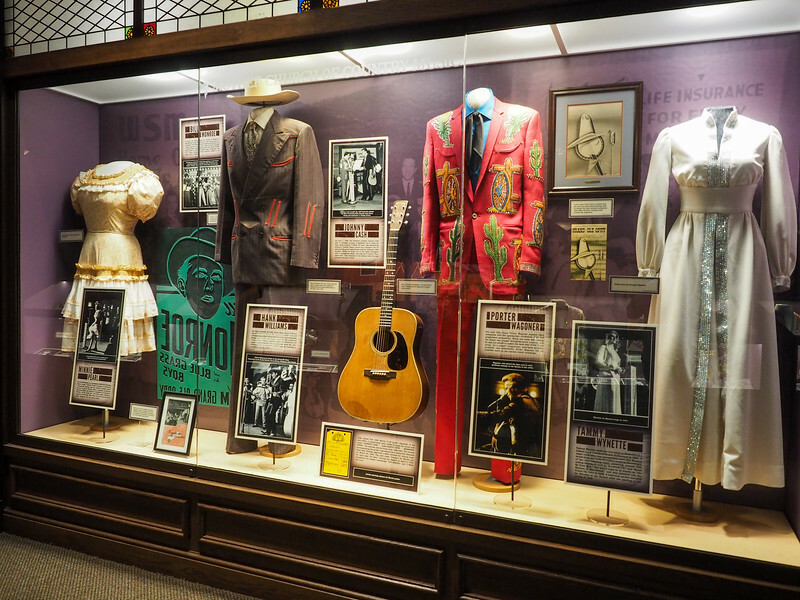 Here you can learn about country music's early influences, learn about the “Outlaw Movement” of the 1970s that was in direct backlash to the “Nashville sound,” and see lots of costumes and memorabilia from some of country's biggest stars. 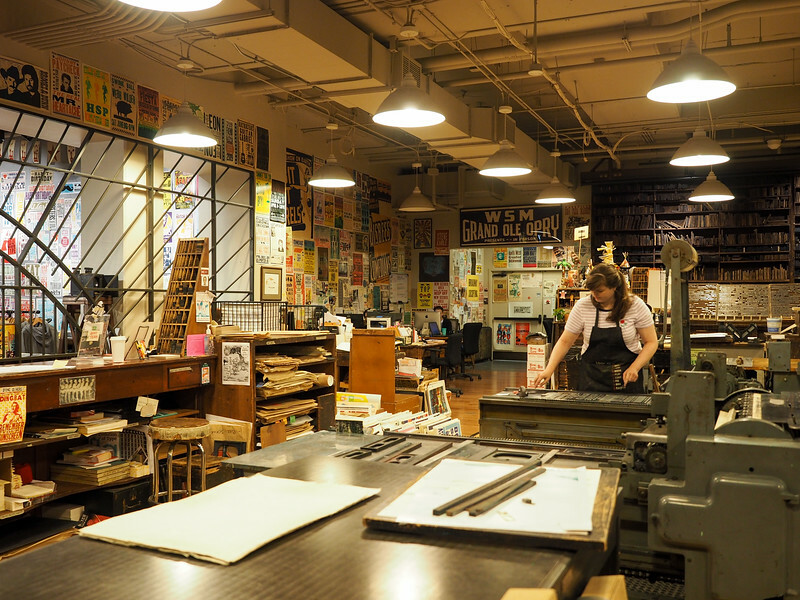 From the museum, you can also book tours to the famous RCA Studio B (where everyone from Elvis Presley to Dolly Parton recorded albums), and of Hatch Show Print, which is traditional letterpress print shop that still prints show posters for the Ryman. With my geeky journalism background, the Hatch Show Print tour of course jumped out to me as a must-do. 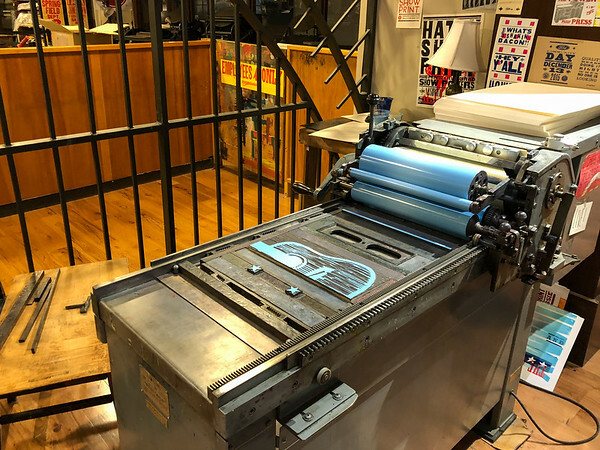 You don't see much letterpress printing any more in this digital era, and the shop also firmly holds a place in Nashville's musical timeline. 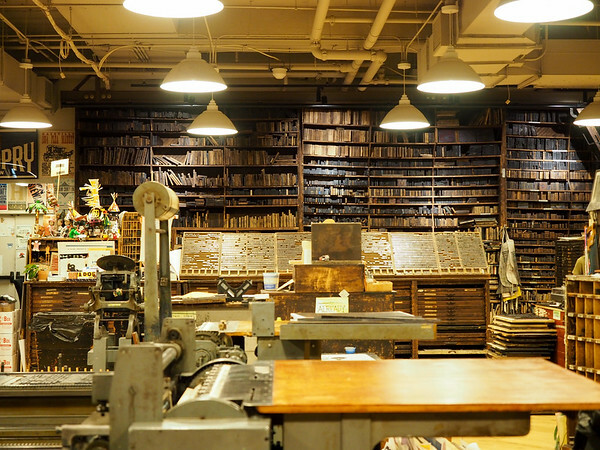 The original print shop was opened in 1879 by Charles and Herbert Hatch, sons of a printer from Wisconsin. The Hatch brothers began printing promotional posters that were more eye-catching than what people were used to seeing, and their business flourished. 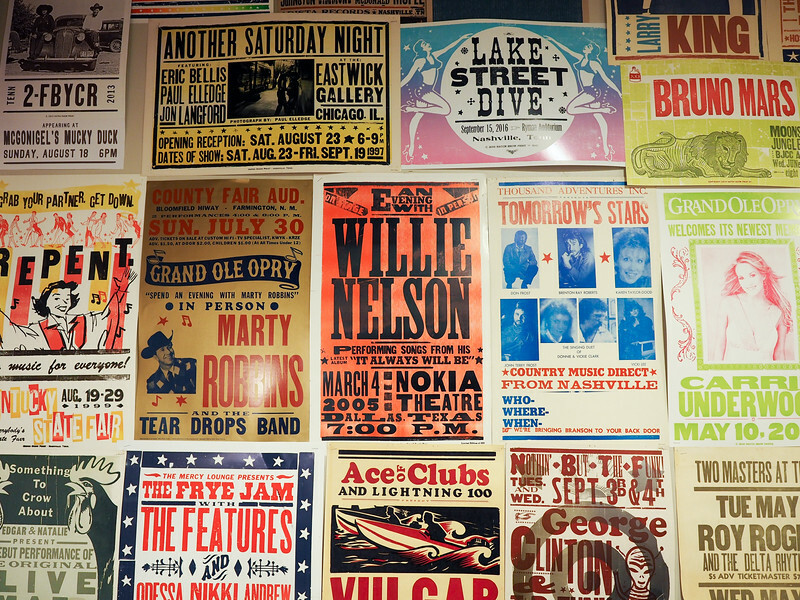 From the 1920s through the early 1990s, Hatch Show Print's shop was located behind the Ryman Auditorium, and they printed show posters for all the biggest names in country music. 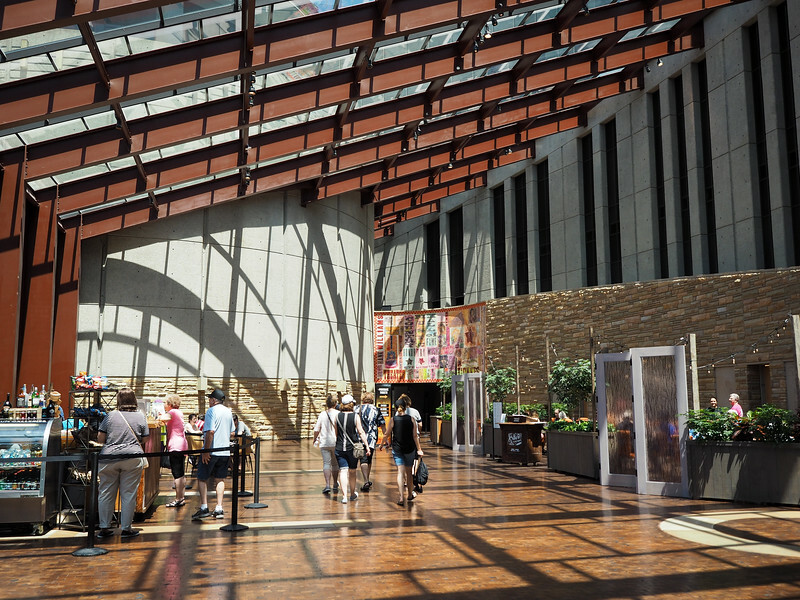 Today, the shop is located within the Country Music Hall of Fame and Museum complex. A tour of Hatch Show Print includes an overview of the printing process and history of the company, followed by a chance for you to print a poster of your own. What impressed me the most about this tour was learning about the skills the artists need (each artist sees each of their projects through from design to printing), and the fact that every letter, shape, and face plate ever carved at Hatch has been saved and re-used. This makes for some very cool re-prints. Nashville wouldn't be Nashville without tons of live music, so after the Country Music Hall of Fame, I recommend heading up a few blocks to the “Honky Tonk Highway.” This stretch of Broadway between 5th and 3rd is lined with bars and music venues that will have live music from the early afternoon well into the night. The most famous venue along the Highway is probably Tootsie's Orchid Lounge, which has been a favorite haunt for country music's biggest names for decades (mostly because it's right across the alley from the stage door of the Ryman). You'll find live music venues all over Nashville; look for the guitar pick-shaped “Live music venue” signs outside of bars and cafes. 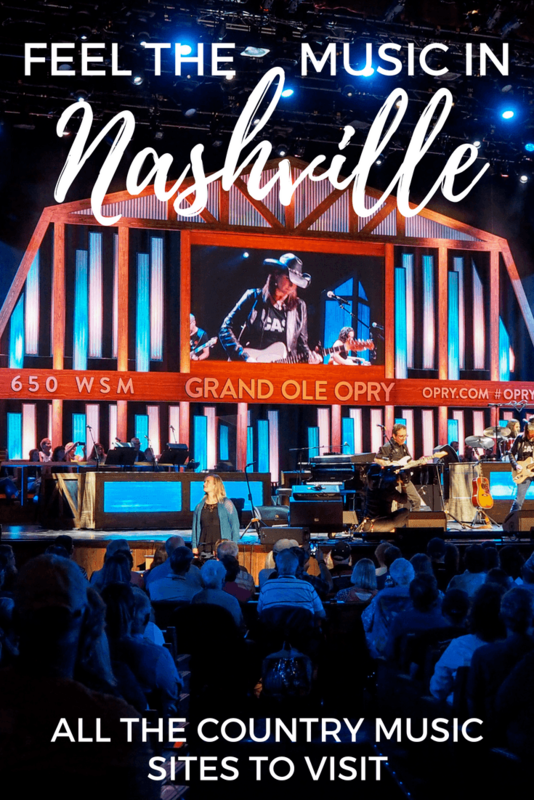 Round out your country music immersion in Nashville by checking out a show at the Grand Ole Opry. The Opry is not actually a venue, but rather the name of a live radio show that began airing in 1925 by WSM in Nashville; the show is the longest-running radio broadcast in the US. 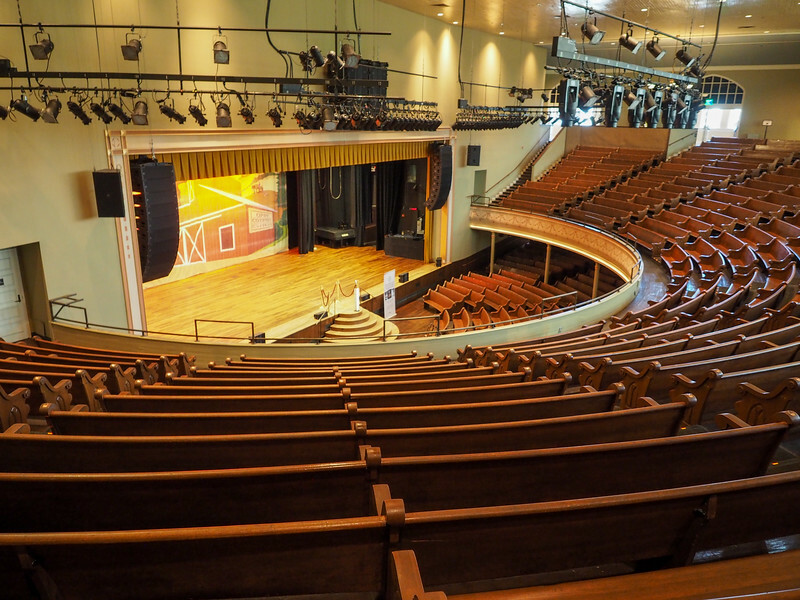 After the Opry left the Ryman Auditorium in 1974, it moved to its current home at the Grand Old Opry House, about a 20-minute drive from downtown Nashville. 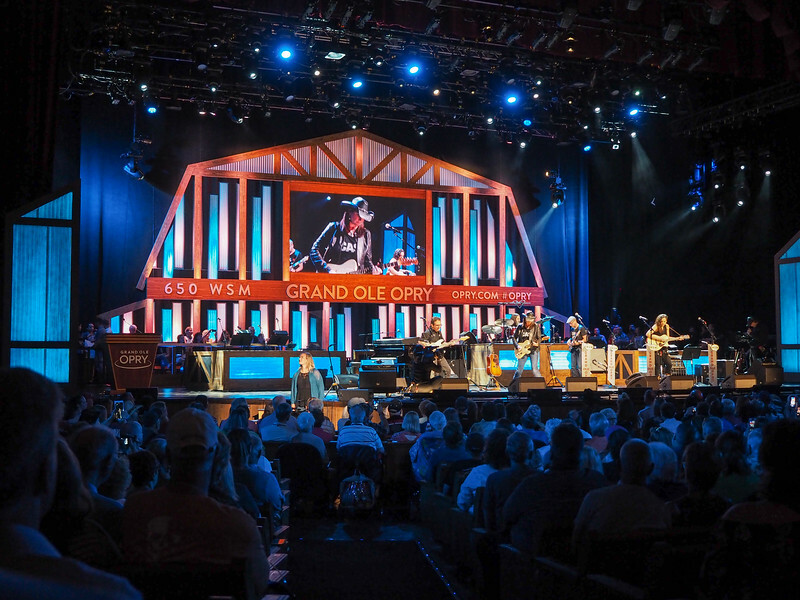 Today, the Opry performs live every Tuesday, Friday and Saturday at the Grand Ole Opry House from March through November, and returns to the Ryman Auditorium during the winter months. Even though country music isn't “my thing,” I knew that going to an Opry show was a must-do in Nashville. And it just so happened that I was in Nashville in the lead-up to the annual CMA Fest, when all the big names in country music were in town. The show I saw, therefore, was peppered with huge names, like Ricky Skaggs, Whisperin’ Bill Anderson, Darius Rucker, and Carrie Underwood. What I really enjoyed about the Opry is that it's more variety show than country music concert. There are usually a handful of acts taking the stage each night, with each of them only performing 3 songs. This means that you get to hear a wide variety of music over the course of a 2-hour concert – everything from bluegrass to country-pop to more traditional honky tonk sounds. And let me just say this, too: In a world of auto-tune and terrible live auditions for music competition shows, it's easy to get disillusioned by performers in general. But every single one of the acts I saw at the Opry (and I saw seven of them) sounded AMAZING live. And the best part? These behind-the-scenes VIP tours are available for anyone to book. 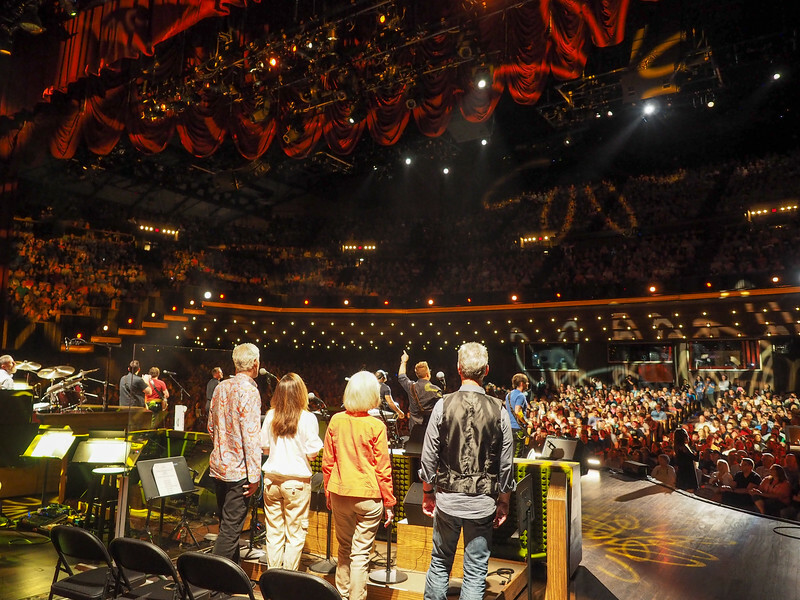 It's a great way to enhance what is already a cool experience at the Grand Ole Opry. Even if you're like me and say “I'm not really a country music fan,” I still think the Opry is a must-do in Nashville. Now that we're on a roll, here are even MORE spots to visit to get your music on in Nashville. “Music Row” is basically a handful of streets near Vanderbilt University that record labels and recording studios call home. The thing that surprised me about this part of Nashville is that Music Row looks like a totally normal residential neighborhood. If not for the signs promoting artists or announcing the names of record labels, you would just assume you were driving down a normal street lined with homes and churches. I saw Music Row while on a hop-on, hop-off trolley tour of Nashville, which I think is probably the best way to see it since your driver/guide can point out all the famous studios and labels for you. 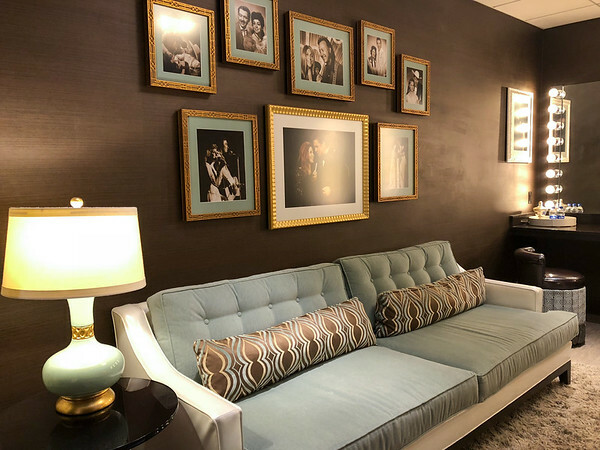 The historic RCA Studio B is located in this part of town, but remember that if you want to take a tour there, you'll book your tickets and get picked up at the Country Music Hall of Fame and Museum. Nashville is home to a few museums dedicated to specific artists, too, like the Johnny Cash Museum, The George Jones, and the Patsy Cline Museum. Other music-related museums in Nashville include the Musicians Hall of Fame and Museum (which is not country music-specific), and the National Museum of African American Music, which will be opening in 2019. At the corner of Demonbreun St. And 4th Ave., you'll find the Nashville Music Garden and Music City Walk of Fame Park. Just like the Hollywood Walk of Fame in Los Angeles, here you'll find stars in the pavement – except all the stars here are dedicated to musicians who have left a mark on the music industry. 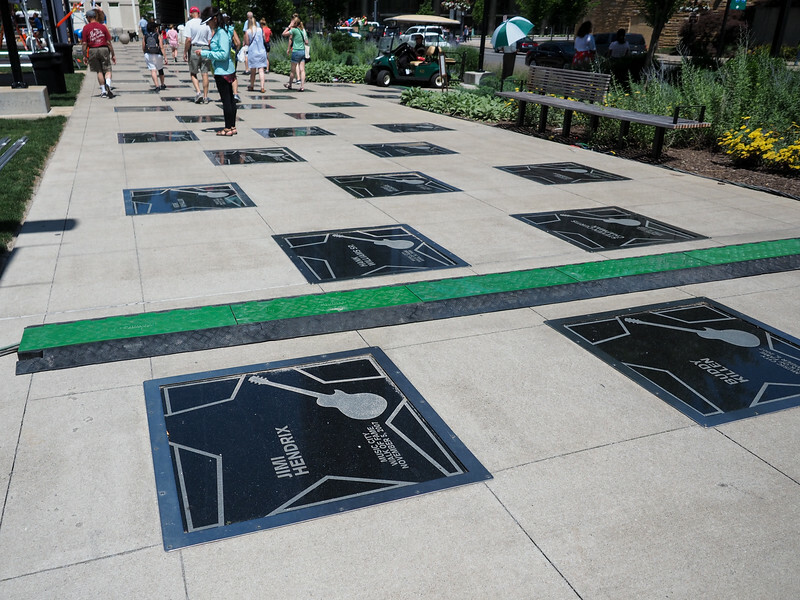 The Music City Walk of Fame spans all genres and generations of music, too, so don't be surprised to see names like Jimi Hendrix right alongside Elvis and Emmylou Harris. 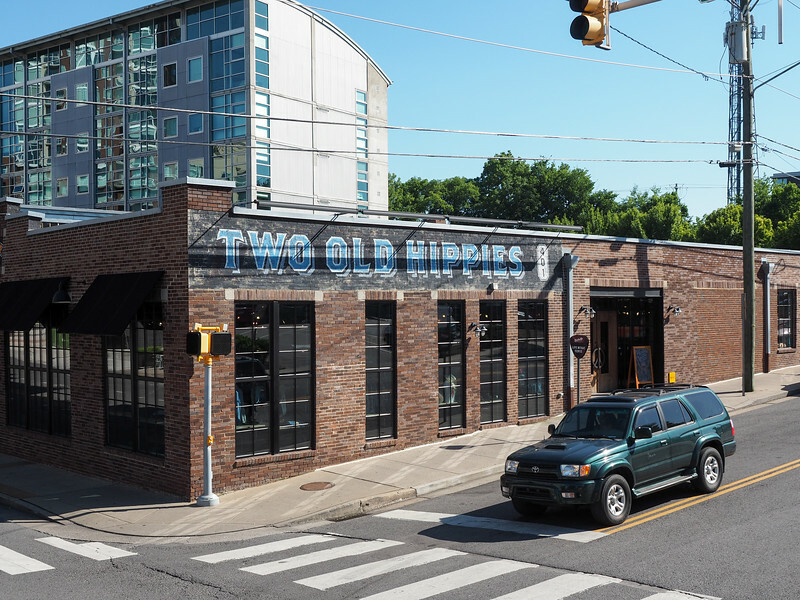 Lastly, if you were a fan of the TV show “Nashville,” then you might want to hit up spots like The Bluebird Cafe (definitely make reservations) or Two Old Hippies in The Gulch neighborhood, both of which were featured on the show. Or book a tour of “Nashville” filming locations. Going to be visiting a lot of the music sites mentioned in this post? Consider picking up a Nashville Music Attraction Discount Pass, which includes entrance to the Country Music Hall of Fame and Museum, RCA Studio B, the Ryman Auditorium, and the Johnny Cash Museum. 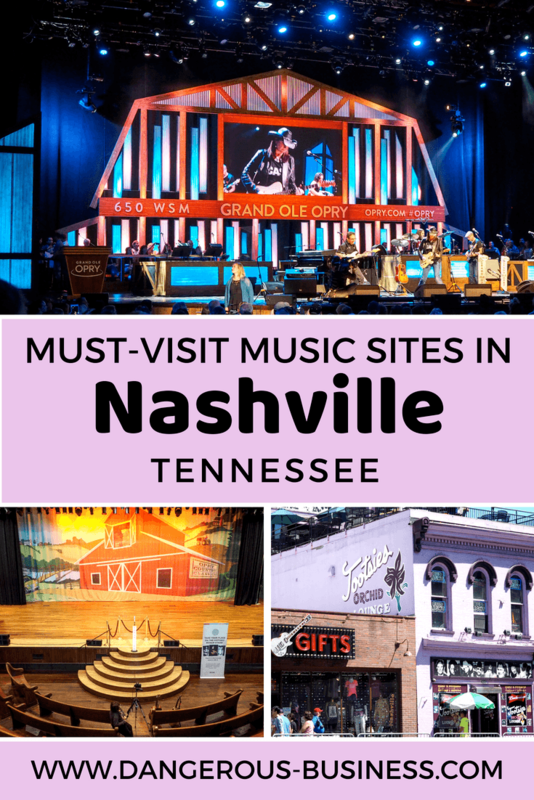 In order to make the most out of your time in Nashville, I definitely recommend staying downtown in order to be within walking distance of many of the music sites listed here. On my first trip to Nashville, I stayed in an apartment-style hotel called Stay Alfred at 505. 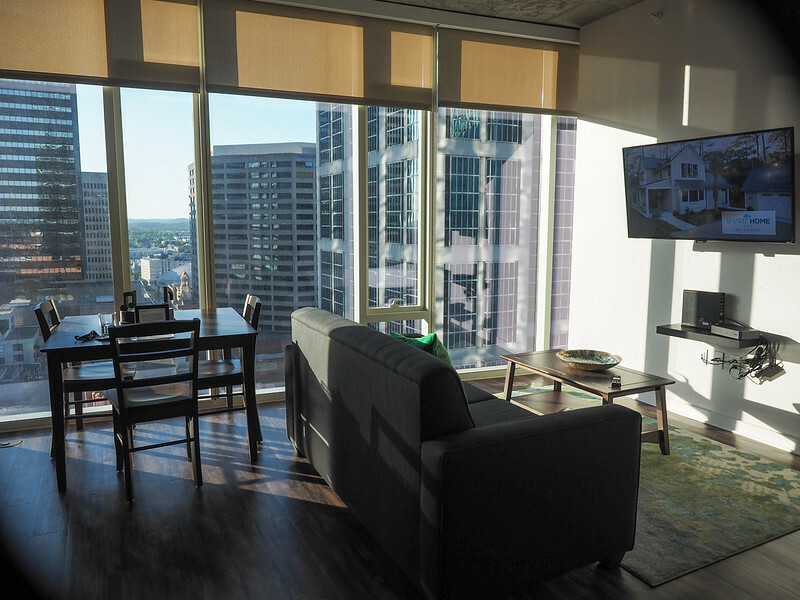 I loved having a small kitchenette and laundry in-unit, and loved even more that I could walk to everything from the Ryman to all the museums in less than 10 minutes. And for spots that are further away? Both Uber and Lyft operate in Nashville and are really affordable. Would you go to Nashville just for the music? Thanks to the Grand Ole Opry for hosting my stay in Nashville. I also received a free food tour from Walk Eat Nashville, but, as always, opinions are 100% my own. I got the opportunity to attend a Grand Old Opry performance when I was a kid. What I loved was the radio feel and how well known performers would come unannounced. It was one of my favorite experiences growing up. Now I want to go back and a see some of the other sites you recommended, like the Hatch Show Print! I loved the “ads” and games they would play in between sets – it was fun and really unique. That’s good to know! That whole strip does feel very touristy now, but it was still fun to wander around – and the live music is still pretty good! I just was talking with my friend last week about going to Nashville for CMA Fan Fest. Now you have just added all whole new perspective of Nashville. We are foodies so I much appreciate the restaurant suggestions and the food tour. This is exciting! There’s SO much to do in Nashville! I’m already planning another trip back in order to do all the non-music-y stuff that I missed! Great story about music history. I dream about going USA soon. I will add this place to my bucket list. 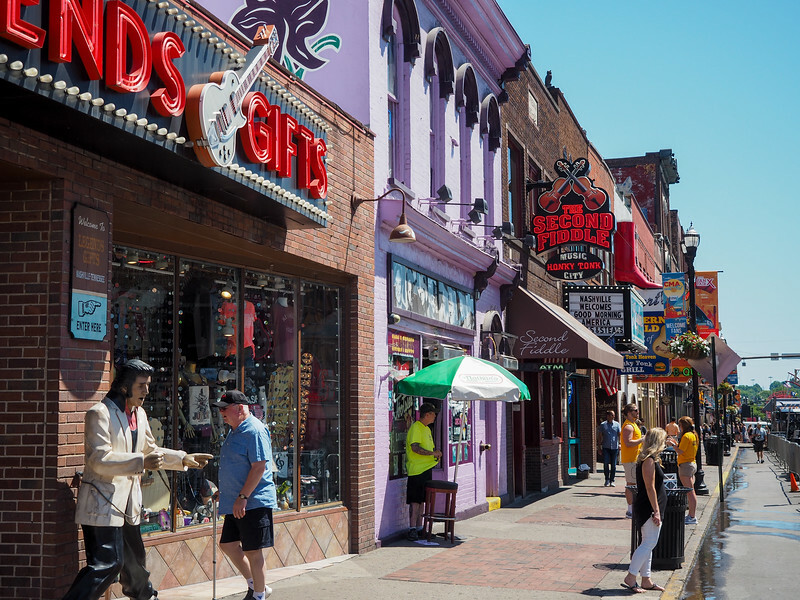 Nashville is definitely a must-visit, especially if you like music. But even if you don’t, I’d still probably put it on your list, as it’s a very cool city! I know, right?? The tour of the Ryman was so fascinating. My wife and I are longterm residents of Nashville with deep roots in the music business. She sang and danced at Opryland (yes, before Dollywood, there was another park right across the street from the Opry House). My Uncle Louis Buckley’s record shop, was one of the first and largest Nashville shippers of vinyl via USPS. Uncle Louis took me many times to the back stage of Ryman…still, our favorite venue. Most of us here are warm and friendly and we welcome one and all to our growing…and changing cityscape. How cool! I know I’ll definitely be back to Nashville! I think you’ve managed to cover more music history in one short visit than I have in an almost-lifetime of living in Tennessee! Well done. Haha, thanks! I made it my mission for this trip. I’ve never been to Nashville but it seems like an exceptional place to explore, Amanda. I’ve learned so much about country music from your post. Is a day to Nashville a good idea? I’m glad you learned something! I think you need at least 2 days to explore all these spots in Nashville, though you could squeeze most of them into one day if you started really early! Awww, you’re taking me back to my trip to Nashville! 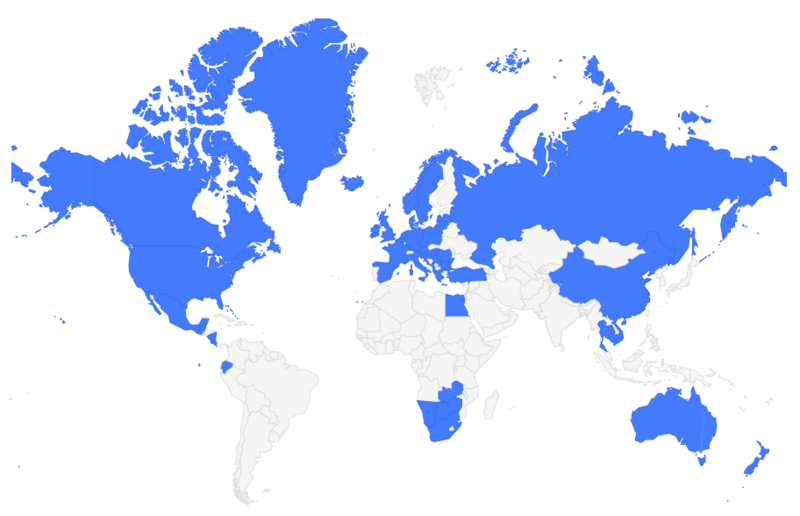 I went to many of the same places. It’s such an incredible town! There’s so much to do that I definitely want to go back really soon. The Hatch Print shop was incredible and I loved the music scene on Broadway (I was surprised that only about 1/3 of the acts were country). Fantastic post! Hatch Show Print was SO cool. And yes, I’ll definitely be going back! having lived in Nashville I have to say… you are spot on with these choices! Thanks very much! I had fun writing this one. I like country music, but I don’t know much about its origin. This post would be a perfect handhold for me when visiting the city. Attending a concert in the Grand Ole Opry is highest on my list though! 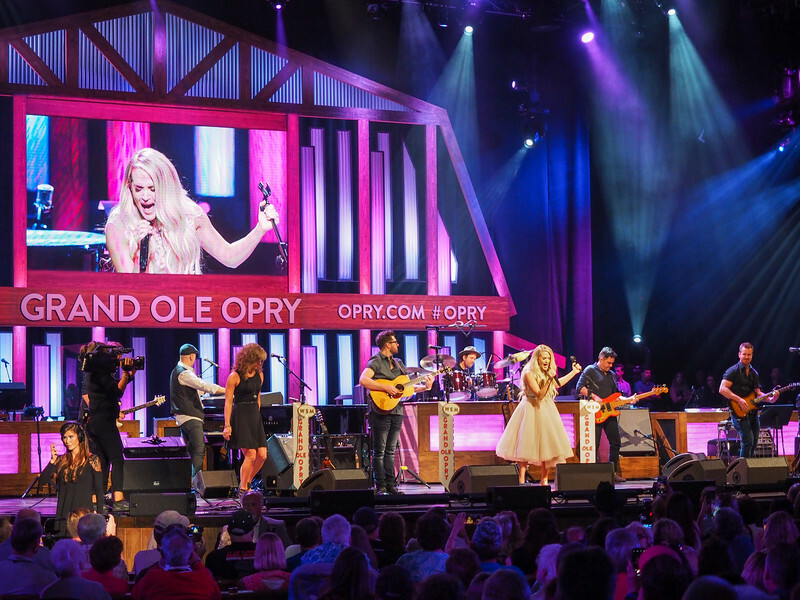 A show at the Opry is definitely list-worthy, especially considering that tickets are pretty affordable! It’s not really a place I can see myself visiting, but I think this post is perfect for those music loves looking for something fun to see! I don’t enjoy country music at all, my husband does though, and I do appreciate the history which surrounds the genre. The Hatch Show Print tour looks really interesting as I have a background in journalism as well. Thanks for the ideas to add to an itinerary should I ever find myself visiting Nashville. I was surprised how much I LOVED Nashville, despite not loving country music. On my next visit, I’m going to write about all the non-music things to do in the city (because there are a lot!). Yup, Nashville has become a VERY popular spot for bachelorette parties. But there are plenty of other things to do there, too! This is awesome! I’d love to visit Nashville so much, it sounds right up my street with great music and great atmosphere. This makes me want to visit even more! That definitely sums up Nashville – I loved the vibe there. Nashville is one of those cities I would love to visit. Your post shows me that there is so much history and musical roots. Thank for sharing! I’m a big history nerd, so Nashville was fascinating in that respect. But also just a really fun city, too! There’s so much music in Nashville. I loved going some of these paces while I was there but this is a great list of so many more places! Such a great idea to help people decide where to go on their trip. Hopefully this will inspire a few more people to go to Nashville! Grand Ole Opry was perfect, looks like you had a great time. First time to hear about the nashville, and it looks like cool. I did have a really good time at the Opry – totally different to other concerts I’ve been to, but really fun! I don’t live too far away from Tennessee, I would love to visit Nashville soon. I love history and music. What a great post, I will save this for the future. You should definitely go, especially if you live fairly close! It’s such a fun city. I love reading your introduction. I am not familiar with country music but whenever I listened I loved them. Glad I came across this post. I came to know so many new things. Thank you for this lovely share. 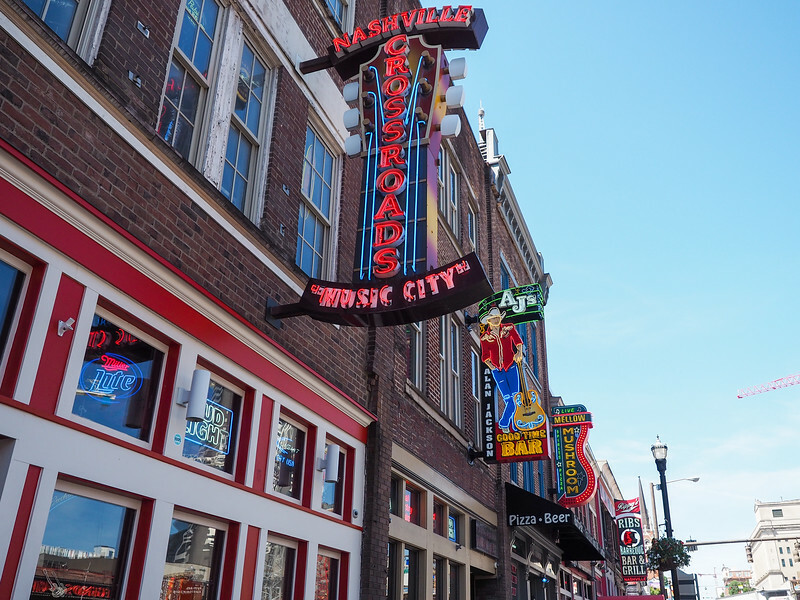 Country music is really popular here in the US, but I think you can definitely enjoy Nashville even if you’re not super familiar with the music! I am not a huge country fan but with so much history in these places it’s kinda hard to not want to visit! I really like the costumes in the Ryman and how cool would it be to have a replica of an old music poster in your home? The history and overall vibe definitely won me over! And the Hatch Show Print tour was so cool! I definitely came home with a poster. Thanks! I had a lot of fun in Nashville!